It has been an incredibly busy few days with the opening of Flexi Work Space on Tuesday 1st May 2018, members moving in and lots of great press coverage in Business Eye, The Irish Newry, The Belfast Telegraph and Newry.ie to name but a few. Here’s a summary of the reports and some pics from the day. 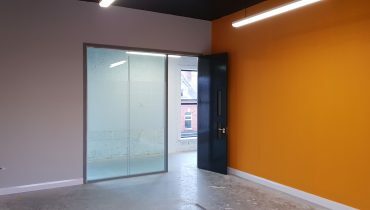 A Newry-headquartered firm has invested a quarter of a million pounds in a shared, community-driven and fully serviced Coworking office space initiative in Monaghan Street in Newry. Flexi Work Space in Newry was officially launched today by property development and investment firm Parker Green International, following its major investment in the project. It is the developer’s second venture of this kind, following a fit-out of the Merrion Buildings in Dublin in 2016 for serviced office use also. Located in the heart of Newry City, the space is at the centre of the busy Creamery Quarter and is within close proximity to a plethora of cafes, shops and local businesses. Flexi Work Space’s members can take full advantage of a flexible working environment, world-class IT infrastructures and front of house support for as little as £75 per month. 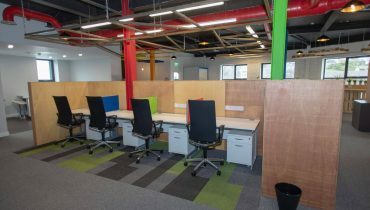 Garrett O’Hare, Chief Commercial and Operations Officer, Parker Green International commented: “We are thrilled to launch Flexi Work Space in Newry, during a time when Coworking is growing rapidly across the globe. The site also includes stylish break-out areas, privacy booths, complimentary artisan coffee and high-speed broadband. Furthermore, tech and business social meet-up events will take place at Flexi Work Space regularly, and attendance at these is included in the membership packages. Mr. O’Hare added: “We have always been very focused on the psychology of how people interact, particularly when it comes to the built environment.